The market is relatively new and the products are even less known by many professionals and individuals, so the first purchase of a 3D printer may seem difficult. However, it suffices to determine your 3D printing needs, and to take into account certain technical criteria, to buy your 3D printer with ease. Makershop will help you in this process by highlighting the main selection criteria. 3D printing can meet a wide range of needs, with prices ranging from €500 to €500,000! A €500,000 machine is obviously not intended for the same use as a €1,000 or €5,000 one. They are usually intended for the production or printing of materials such as metal, whereas desktop printers are generally dedicated to rapid prototyping. 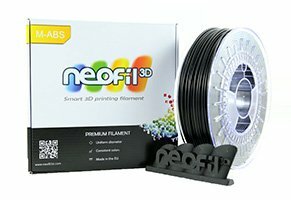 We still find, nevertheless, FDM 3D printers or SLA 3D printers for several tens of thousands of euros, for results that, today, are identical to the best desktop 3D printers, such as those sold by Makershop. A price range: between €1,000 and €10,000 in theory, mostly between €2,000 and €7,000. A process: the vast majority of these 3D printers use a "Fused Deposition Modelling (FDM)"process. That is to say, the filament is heated and deposited, layer by layer, so as to construct, bit by bit as the layers (generally of plastic) stack up, the desired object. Other processes (Laser, Stereolithography, etc.) generally have higher purchase costs, have other advantages and disadvantages, and are intended for uses more suited to industry than individuals. 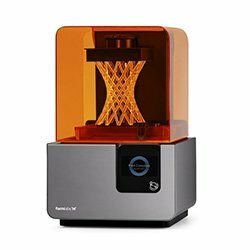 Formlabs, for example, shakes up the stereolithography 3D printing market with its Form 2 3D printer, offering professional quality for less than €4,000 including taxes. A certain maximum volume: for the 3D printer and its print volume. So, if you want to print pieces an average of 20x20x20 cm (up to 1.50 m for custom 3D printers), whether the machine is intended to produce prototypes (in one piece or by printing multiple parts before assembly), models, jewellery, toys, decoration, etc., and you have a budget of €1,000 to €10,000, desktop 3D printers are for you. Desktop 3D printers are ideal for individuals and businesses because they cover all their needs, at an affordable price. Regarding current price levels, you can find machines under $500 by buying abroad, however, you must take into account the delivery charges, VAT on imports (20%), customs duties, the difficulty for service abroad (slowness, return shipping costs) and the quality of the 3D printer. Not counting the quality of prints, which is inadequate from a professional viewpoint. Then comes the entry level (generally between €800 and €1,500) with good machines that perform well, without going overboard. They would be well suited to individuals wanting to discover and tame 3D printing. From €2,000 to €5,000 we find the medium/high-end personal 3D printers manufactured by industry leaders such as Formlabs and Ultimaker. With these machines, you are assured of excellent product quality (reliability, robustness, design), optimum rendering of your prints, a product warranty, powerful software, and adjustable precision. This is the safe, reliable and quality choice, the choice of the most professionals. The accuracy of a 3D printer includes two concepts: the thickness of the filament layers that will be deposited (vertical accuracy) and the accuracy of the XY axes (horizontal accuracy). Great print quality results in greater fineness and, therefore, smoother rendering of your object, as well as the ability to print more very fine details on your creations. The average range of maximum layer thickness for personal 3D printers is, on average, between 50 and 100 microns (100 microns = one-tenth of a millimetre). 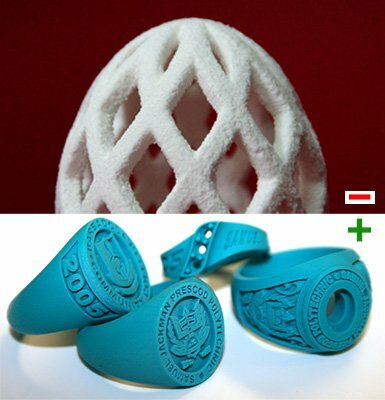 Some printers even offer accuracy up to 20 microns (3D printer Ultimaker2 Extended+). This concept is the most critical of the two in the choice before buying your 3D printer. It should be noted, however, that an accuracy of about 100 microns is sufficient to obtain objects with a good surface condition. The accuracy of the XY axes positioning is less looked at than layer height, particularly because it varies a lot less from machine to machine and may not even be mentioned by manufacturers. However, it is important because it ultimately determines the horizontal accuracy of your 3D printer (in addition to the layer height, vertical accuracy). There is also the Z axis positioning accuracy, but it is nearly always between 2 and 5 microns and is not a selection criterion since the accuracy of the vertical rendering is determined by the layer height. Communicated in "mm/second", the print speed depends on the machine, but is also highly dependent on the desired print quality! So, printing an object with an accuracy of 100 microns can take a lot longer than with an accuracy of 300 microns. Switching from an accuracy of 300 to 100 multiplies the print time by more than three (counting the additional movements). The speeds indicated by the manufacturers or Makershop are for information purposes because it is often possible to push the speed beyond those indicated, however, at the expense of the quality and success of printing. The extrusion head is the print head of your 3D printer. If you can be satisfied with printing in one colour at a time, then a single extruder will be sufficient. However, if you want to use two colours and/or two materials simultaneously, then a machine with two extruders will be necessary. Dual extrusion allows you to use, in particular, PLA for your object, and PVA for supports that dissolve in water (for spread arms on your figurine, for example). You must, nevertheless, take into consideration that printing in 2 colours/materials is a bit more difficult to set up than a simple extrusion, with less clean surface renderings. Including the brand in the main criteria may seem exaggerated. However, this is an emerging technology, where some brands have proven themselves and are recognised for their quality, and other, lesser known players are trying to get a piece of the pie. Among the renowned brands: Formlabs, Ultimaker or LeapFrog, for example. At Makershop, we choose quality for our customers. Therefore, we give pride of place to the most renowned printers, such as the Ultimaker 2 by the brand of the same name, or, in the entry level, the FlashForge Pro 3D printers from the technology of the original Makerbot Replicator 2X (open source technology). The support offered by your dealer is also an important point. Will you buy your machine on a large general website (not specialised in this technology) and on which the support team is overloaded, or from a dealer specialised in this technology that requires special knowledge? At Makershop, our team specialises in 3D printing and ensures fast, efficient customer service, by phone and email, who will give you advice on the products best suited to your needs, support you after your purchase and manage any problems that may arise. "Secondary criteria" does not mean that they should be taken lightly, but they will serve as adjustment variables once you have identified your six main criteria mentioned above. The print volume of personal 3D printers varies greatly, but generally does not exceed 25 x 25 x 25 cm. The price of the machine relative to its size is of course one of the reasons. However, this limitation also has a practical side. Indeed, by increasing the print volume, you also increase the probability of a failed 3D print: you increase the amount of material to be injected (with the amount, there is an increasing likelihood of a filament failure, an air bubble, etc.) and the required printing time (a large volume object will take longer to print and will increase the probability of failure for various reasons). In summary, volume certainly is important, but it is generally a non-issue (not for everyone, of course); you always have the option of resizing your models, and, if not, assembling your prototypes. We believe it is preferable to prioritise the criteria mentioned above for a good 3D printer purchase, hence the relegation of this criterion to second place. Placed in secondary criteria because, in most cases, the materials you will use will depend on your printer and not the opposite; in addition, conventional materials for additive printing, i.e. ABS and PLA, are accepted by the vast majority of printers. However, if for a specific reason, you must use a specific material, it will obviously become an essential criterion in the choice of your 3D printer. Your choice at this level, if you want to print in other materials, will therefore be based on the presence or absence of a heated bed to accept wood or stone type filaments, Nylon, carbon filled filament, etc. To learn more about the different materials, please visit our comprehensive consumables guide for 3D printing. Software is provided, or not, depending on the brand and machine. This 3D graphics modelling software sometimes allows you to completely create your objects, but, usually, allows you to adapt the print to your printer (setting dimensions, temperature, etc. ), and perform basic retouching and directly communicate with your printer in an adapted manner. The different software offers variable performance and start-up. Again, the most recognised brands generally offer high-performance software and are more ergonomic for the uninitiated. It should be noted that it is also possible to get professional 3D printing software such as Simplify3D. given the price of these highly technological machines, the warranty is also important. Does it include the cost of replacement parts? Labour? What is the term of the warranty? The warranty implicitly increases the purchase price, but it assures you a certain peace of mind when facing a possible glitch. Makershop offers as many guarantees as possible on products sold on the website so you can take advantage of this new technology with peace of mind. Visit our Product warranty page. The community around your 3D printer brand is also important when dealing with your printing problems. Have a maximum number of people using a certain machine ensures that you can find help online if necessary. Favouring the major brands is usually clever as the community that has developed around their products is potentially quite large. 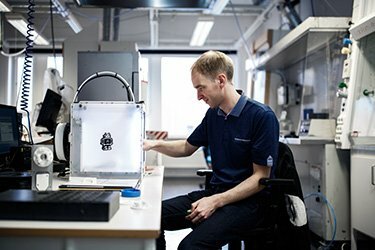 The best example in this area is Ultimaker because the community around the world leader in desktop 3D printing is very large, dynamic, and even a source of improvements on Ultimaker printers. Ultimaker has notably set up the 3D model sharing platform YouMagine, where thousands of users share thousands of directly downloadable, free models.